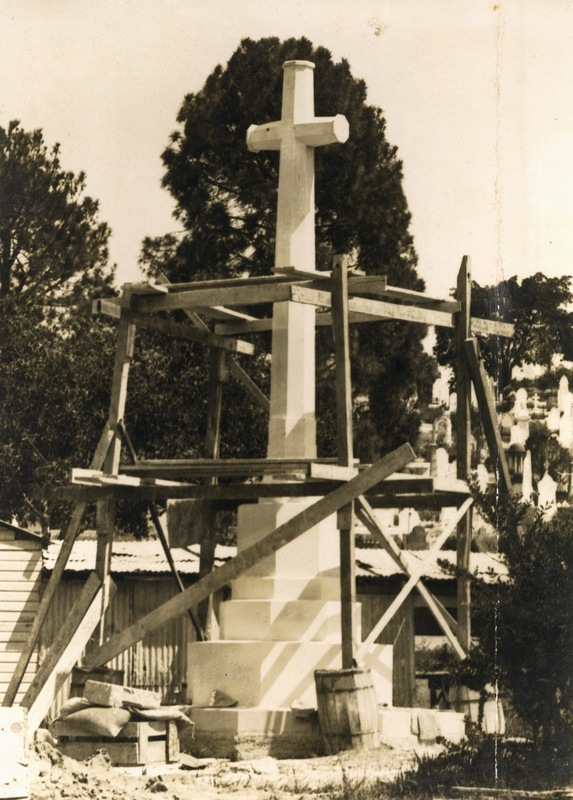 ABOVE: A view of the scaffolding that enveloped The Cross of Sacrifice in late February-early March 1924 at Toowong Cemetery. On 26 September 1923, the ANZAC Day Commemoration Committee voted to accept the £720 quotation from the Toowong-based firm of master monumental masons, A.L. Petrie & Sons, to devise and erect The Cross of Sacrifice. 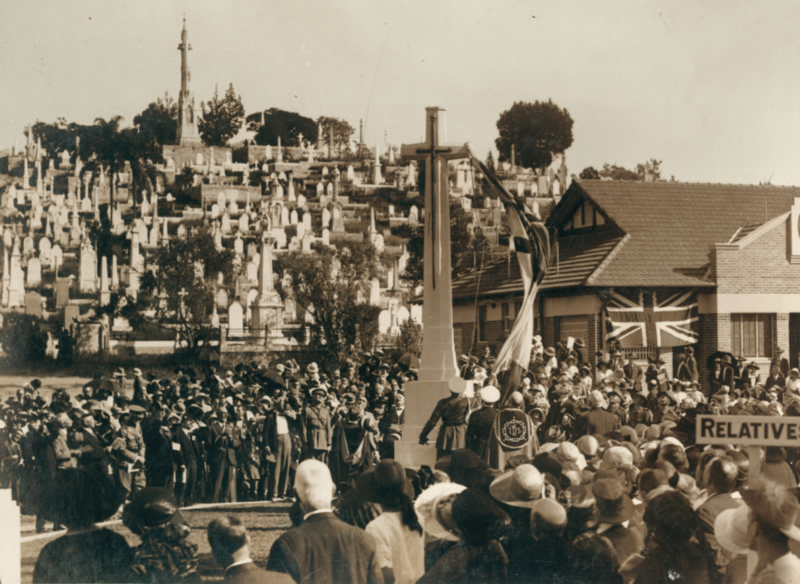 The Stone of Remembrance and The Cross of Sacrifice were officially unveiled a mere 212 days later, on Anzac Day, 25 April 1924. 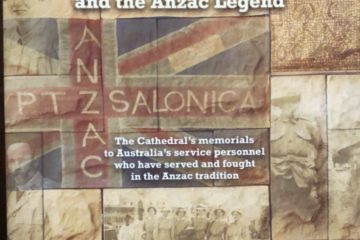 For 92 years, 10 months and four days Australia’s first Anzac War Memorials were left unmolested as they stood sentinel over the nearby graves of at least 270 First AIF returned service personnel. Come Ash Wednesday 2017 and the Cross’s centrepiece, The Sword of Sacrifice, was vandalised and had to be recast from the remaining metal shards, at considerable expense to the ratepayers of Brisbane City Council. As it was being repaired in time for Anzac Day 2017, temporary scaffolding surrounded The Cross of Sacrifice once more. Image courtesy of the State Library of Queensland Collection. THE spirit animating the large concourse of people in the Toowong Cemetery yesterday morning [ 25 April 1924 ] on the occasion of the unveiling of The Cross of Sacrifice and The Stone of Remembrance was a pathetic blending of sorrow and pride. There were over 3,000 people present. The large space at the side of the inner enclosure, which had been reserved for the near relatives of members of the A.I.F., and the naval forces who had met their death on active service was well filled, and included many who were carrying wreaths to lay on The Stone of Remembrance. On the other side of the enclosure was a guard of honour consisting of bluejackets from H.M.S. Dragon, under Lieutenant Drew. Prior to the commencement of the ceremony proper, the Brisbane Citizens’ Band played appropriately solemn music, concluding with the “Dead March”, in “Saul”. Punctually at the time appointed, 8:57 a.m., His Excellency the Governor-General, Lord Forster [ Sir Henry William Forster ], who was attended by Lt.-Commander W.J. Seymour [ William John Seymour ], personal A.D.C. [ Aide-de-Camp ], and Brigadier-General L.C. Wilson, A.D.C. [ Lachlan Chisholm Wilson ], arrived at the main entrance gate where he was received by the Acting Premier (Mr. W.N. Gillies) [ William Neal Gillies ], the Officer Commanding Field Troops in Queensland (Major-General J.H. Bruche) [ Sir Julius Henry Bruche ] and the Commanding Officer H.M.S. Dragon (Captain B.W.M. Fairbairn) [ Bernard William Murray Fairbairn ]. His Excellency was then conducted to the scene of the ceremony. At the foot of The Stone of Remembrance the Governor-General was received by the Archbishop of Brisbane (Dr. Sharp) [ Gerald Sharp ], and the Moderator of the Presbyterian Church (Rev. S. Martin) [ Samuel Martin ], who were the officiating clergymen. The latter commenced the religious portion of the ceremony by reading Psalm 46. His Excellency then unveiled The Stone of Remembrance and, accompanied by the officiating clergy, proceeded to The Cross of Sacrifice from which also he removed the flags which covered it. 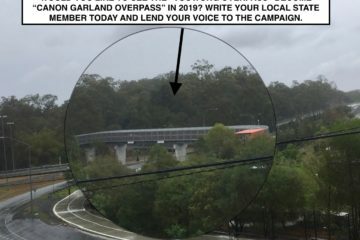 ABOVE: The moment that the Australian Governor-General, Lord Forster, pulled away the Ensign cloaking Australia’s first Cross of Sacrifice war memorial in the-then Brisbane General Cemetery at Toowong. Image from the State Library of Queensland Collection. There was a tense silence for a few seconds until, at the word of command, the naval guard fired three volleys and The Last Post was sounded. The Governor-General said they all were there to do what had been done, and still was being done in the theatres of war thousands of miles away— to pay a tribute of reverence and admiration to the memories of those who, in splendid self-sacrifice, yielded their lives in the service of their country. It was a fitting day on which to unveil those noble memorials — The Stone of Remembrance and The Cross of Sacrifice — and he wished to express on behalf of the Commonwealth its deep appreciation of the services rendered by the Government of Queensland in the provision of that noble stone. In future, anyone who approached that hallowed spot must, he thought, remember the wonderful things that had been done by those whom they sought to honour, and would also think of the spirit of comradeship in which their beloved dead were lying, whether it were there in that cemetery or on the field of battle where they fell. ABOVE: The Royal Navy Honour Guard provided by Ship’s Company of HMS Dragon fire a salute at the official unveiling of The Stone of Remembrance and The Cross of Sacrifice on ANZAC Day 1924. 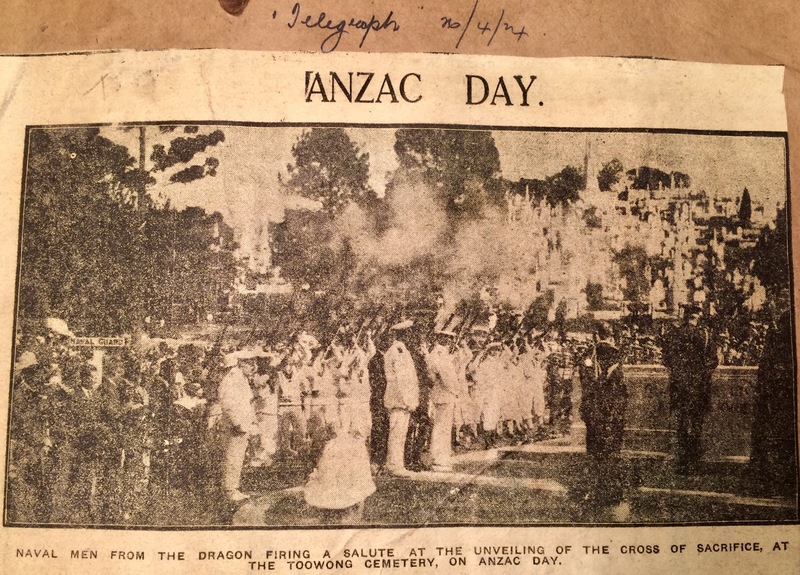 Photo sourced from the clippings scrapbook Canon Garland collated for the ANZAC Day Commemoration Committee of Queensland, and which forms part of that organisation’s Minute Books Collection in the State Library of Queensland. The clip itself was extracted from “The Telegraph” newspaper of 26 April 1924, page 7. Just as they were comrades through all the horrors of warfare, so they believed that they all were comrades still in the peace and glory of immortal life, and it behoved all those who were left behind to do all they could to preserve that spirit of comradeship, in which those heroes had served and in which they had fallen. And the second thought that must occur to them was the thought of remembrance. They remembered the heroic service, the undaunted and undauntable bravery, the steadfast courage and fortitude shown in circumstances of almost incredible horror and hardship, of those who had suffered for them and died for them. The pages of history would record the undying story of their triumph, and so long as the British race lasted, their fame would live and, as had been inscribed on The Stone of Remembrance, “Their name liveth for evermore”. And the third thought which came to their minds was that in erecting that Cross of Sacrifice they were commemorating the spirit of self-sacrifice by men humbly following in the steps of Christ, the Saviour of Mankind. As the years rolled by and as the present generation passed hence, and the recollection of the pain and the suffering and the sorrow of the Great War faded away, there would remain nothing but the fame and the glory of great deeds. Then would such memorials as those that had just been unveiled preserve the memory of those who had accomplished such wonderful things, and inspire successive generations by the splendid spirit in which they had been done. And so, in perpetuating the memory of their illustrious dead, they turned to the sign of Him through whose self-sacrifice they had passed through the vale into the life immortal. Proudly, you gathered, rank on rank to war. To save Mankind— yourselves you scorned to save. Who wait the last dear trumpet-call of God. The Acting Premier (Mr. W.N. Gillies) said the fact that Lord Forster had lost his two sons at the war made them appreciate all the more the great service he had rendered them in performing this sad but important ceremony, on behalf of the State Government, he desired to express his heartfelt sympathy with all those who today mourned the loss of their dear ones. It was fitting that their State, which took the lead in the observance of Anzac Day — the founder of which was a Queensland citizen — should likewise be the first State in Australia to complete The Cross of Sacrifice and Stone of Remembrance. It was likewise fitting that the site chosen by the committee should be in these sacred grounds, where lay the remains of some 350 Australian soldiers, and by that Cross and Stone they paid to them the same homage as was given to those of their own kith and kin, who now lay in the far away cemeteries on the battlefields of France and Gallipoli. 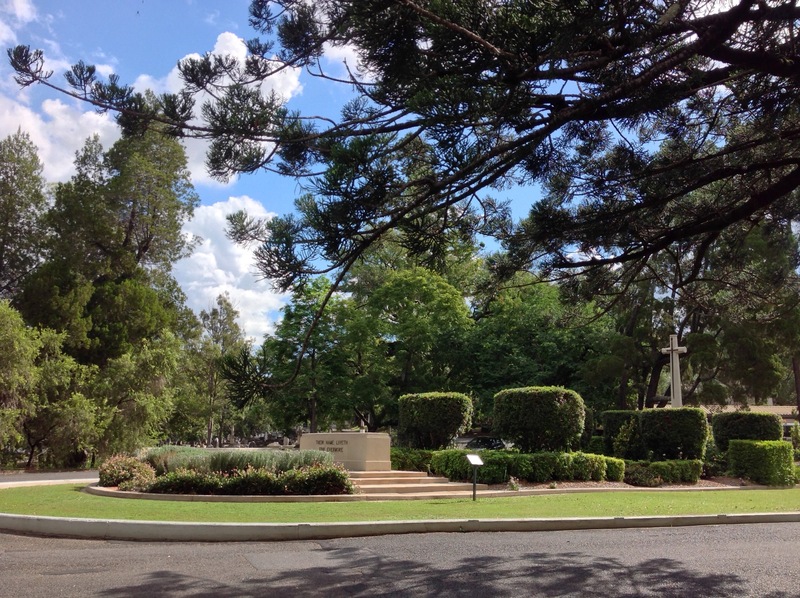 ABOVE: The Cross of Sacrifice and The Stone of Remembrance, now enfolded by Canon Garland Place, near the main entrance to Toowong Cemetery — Brisbane’s largest — and the final resting place of some 395 First AIF and Second AIF personnel – and more than 1,600 others who wore a uniform in the service of their nation in time of war. Photo courtesy of Peter Collins. 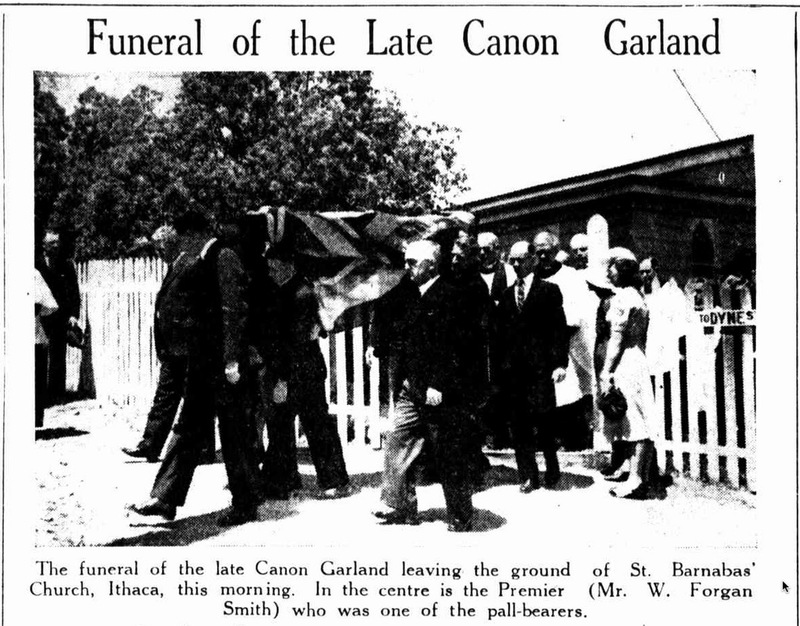 To the credit of the ANZAC Day Commemoration Committee, of which body Canon Garland [ David John Garland ] might well be described as the life and soul, Anzac Day had been observed in this State each year since the memorable landing on Gallipoli on April 25, 1915. It was not an occasion for a lengthy speech, but rather an occasion for humility and reverence, for silence and thought, and for the earnest recognition of the fact that the only lasting comfort or reward for those who lost their sons, their brothers, their husbands, or their fathers, was the fulfilment of the promise of a lasting peace. The placing of wreaths and other floral tributes at the base of The Stone of Remembrance then followed. The first was a handsome cross of gilded leaves with red roses from the Governor-General. From the State Governor (Sir Matthew Nathan) came a wreath of white and pink flowers, with green foliage. The Acting Premier, on behalf of the State Government, laid on the Stone a strikingly effective wreath in the shape of the letter “Q”, made with rich red and golden-yellow chrysanthemums with a background of laurel leaves. A simple laurel wreath came from the R.S. and S.I. League of Australia (Queensland) [ Returned Sailors’ and Soldiers’ Imperial League of Australia (Queensland) Branch ], and others from the ANZAC Day Commemoration Committee and the commanding officer, H.M.S. Dragon. Another wreath which was dropped from an aeroplane and fell among the graves was picked up and placed in position near the Stone. The number of private wreaths was very, large. The, sounding of the Reveille ended the ceremonials. Relatives of Mr. A. and L. Barrett. At the request of Mr. and Mrs. A. Campbell, Mackay, a wreath was placed on The Stone of Remembrance by the joint Honorary Secretaries of the ANZAC Day Commemoration Committee [ David John Garland and Eustace Royston Baum Pike ]. The Brisbane Cemetery Trustees were represented at the unveiling and dedication of The Cross of Sacrifice by Mr. W.D. Grimes (chairman) [ William Douglas Grimes ], Colonel R.M. Stodart [ Robert Mackay Stodart ], Messrs. Petrie, Wassell, Harley, Scott and E. Griffith Oxley (secretary) [ Edward Griffith Oxley ], who was accompanied by Mrs. Oxley. A feature of the unveiling and dedication ceremony of The Cross of Sacrifice was the hovering of an aeroplane over the ground during the ceremony. A wreath was dropped from the ’plane from St. Augustine’s Memorial Church Committee, Hamilton. — from page 7 of “The Daily Mail” (Brisbane) of Saturday, 26 April 1924.